We all know Steve Jobs as a person who restructured modern technology. He was an inventor and the co-founder of Apple Inc. He was born on February 24, 1955 to a Syrian father Abdulfattah Jandali and an American mother Joanne Simpson. He was adopted by Paul Jobs and Clara Jobs shortly after his birth. His adoption went through when Paul and Clara Jobs promised that Steve would receive a university education but he went on to become a college dropout. In high school, at the age of 13 Steve Jobs met a university student Steve Wozniak. Together, they created the first Apple computer. Ronald Wayne was the third founder of Apple but he sold 10% stake after two weeks of partnership for only $800. Steve Jobs was one of the youngest people to make the Forbes List. When Jobs was asked why he had named his company Apple, he replied “Because it came before Atari in the phone book”. Jobs never wrote a single line of programming code. Steve Jobs worked for Atari before co-founding Apple. He, along with Steve Wozniak created the Breakout game for Atari. In 1985, Jobs was pushed out of Apple. Then he purchased the animation studio Pixar in 1986. He is listed as an inventor for more than 340 technology and design patents. In 2003, he was diagnosed with pancreatic cancer. At the age of 23, he had a child Lisa Brennan but denied paternity on her saying that he was a sterile. Lisa’s mother Chris-Ann Brennan had to use welfare checks to raise the kid. He married Laurene Powell in 1991 and had three children Reed, Erin and Eve. 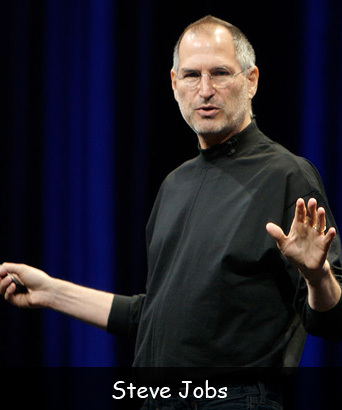 Steve Jobs died on October 5, 2011 from the pancreatic cancer, he had been diagnosed with in 2003.